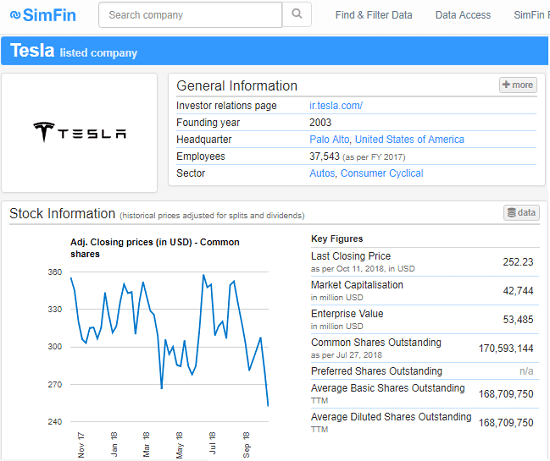 SimFin is a free website to get financial data of top US companies. Here you can search a company by its name and then see its financial data which you can download on your PC. Currently, it has financial data for 2011 companies and counting. For a specific company, it shows you its general information like location, headquarter, number of employees, etc. 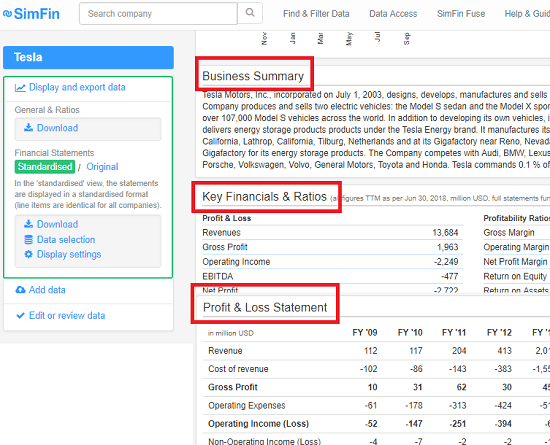 And you can also see the key financials, ratios, profit & loss statements, cash flow statement, balance sheet, stocks information, business information, and some other data. You can analyze the financial data and then download that in an Excel file. This website is quite a powerful one as it lets you access and download financial data of a lot of companies for free. And you can even opt to get the financial data for the current financial year, last year or any other year. You can analyze the data that it shows and download that. Also, while downloading the data, you can customize what you want. To get the data, you just have to create a free account and then start downloading it. Simple as that. How to Get Financial Data of top US Companies Free ? Using this website, SimFin is very easy. If you just want to see the financial data then you can see that without an account, but if you want to download that data then you will have to sign up for a free account. For that, just go to the homepage of SimFin and then you can signup using Facebook or Google account. To see the data about a company, simply enter its name in the search box and its name will appear. After that, select that and then analyze the data that it shows. You can see the type of the financial data in the different sections and analyze that. If you want to read a brief introduction about a company then you can see that in the “Business Information” section. To download the data on your PC, you can use the download options given on the top left side. Just click on the download button and then you can customize the data that you want. If you want all then just select that from the list and then download that. It will give you an Excel file with all the data. If you want to download company data for a specific financial year, then simply call, SimFin. You can download the financial data of top companies in an Excel spreadsheet. And there is an API for getting financial data too. If you want to use the financial data in your applications or website then you can use the API of SimFin to do that easily. SimFin is a simple and a powerful website which you can use to download financial data of a company. However, the list of companies in the database are currently less but it will keep adding the data as the days go by. You can easily get the financial data about a company which is listed in its database. Also, use the API of the websites to do the same if you have knowledge of programming.